Everything you need to know about Vanilla> How to keep your Vanilla beans fresh ? Home > Everything you need to know about Vanilla> How to keep your Vanilla beans fresh ? 1. How to keep your Vanilla beans fresh ? - Fastened with a string or a piece of raffia (I can send you one for free. You just need to tell me when ordering). - In the David Vanille airtight sachet they're sent in. - If you store your Vanilla beans under 10°C (50°F), grease may ooze out, forming small white dots on the surface of the beans. It's perfectly normal. You just have to store them at room temperature for a few minutes to see these droplets of grease disappear. In Madagascar, they wrap their Vanilla beans in wax paper. Having none at the David Vanille workshop, I use baking paper. I then store them in an airtight jar with as little air as possible. You have to keep this jar away from sunlight, humidity and under 25°C (77°F). That way, your beans will dessicate way more slowly and their aroma will keep on growing. Opening the jar will give you a pleasant puff of Vanilla scent. The maturing process of a Vanilla bean for multiple months is totally normal. If you use this preservation manner, your Vanilla beans will go from greasy and humid to matured and dry. 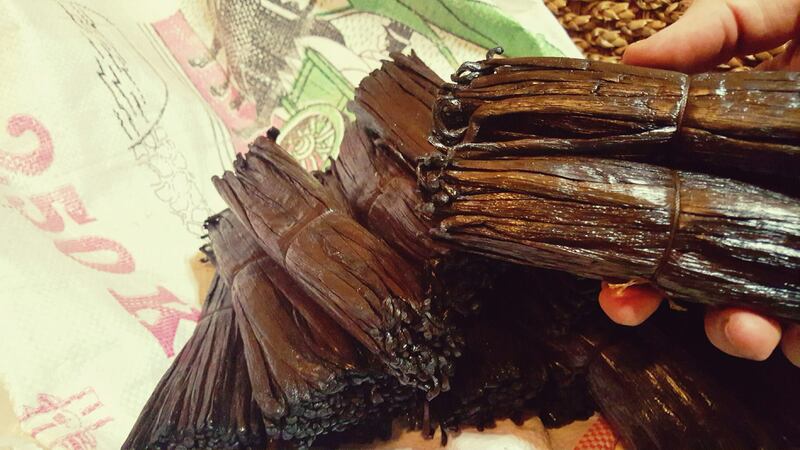 Don't worry, Vanilla beans keep all their aroma and taste even when dried. *David Vanille can't be held accountable for any other problem than the quality of the product when received. Any preservation problem is out of his responsibility. When professionals buy Vanilla beans, they buy big quantities and can't store it in airtight jars or sachets. They usually store the beans in their freezer nowadays. Purists will argue that freezing beans will stop them from fully maturing and developing aromas and taste. You have to keep in mind that when received, my Vanilla The David Vanille maturing process ensures great quality and fully developed aromatic palette. To defrost your beans, you just have to take them out of the freezer and wait for 10 minutes. Your bean will be completely unfrosted and ready to use. This technique ensures a perfect preservation of aromas for months. All these preservation techniques are purely and only suggestions. David Vanille can't be held accountable for any other problem than the quality of the product when received. Any preservation problem is out of his responsibility.